Home / andrapradeshnews / JAGAN ANNA....WHAT IS THIS ANNA? JAGAN ANNA....WHAT IS THIS ANNA? 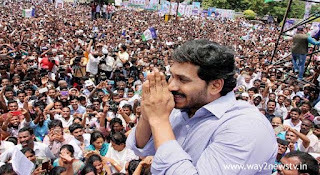 The promises of Jagan's pedagogy are the same for the common people, but to analysts, economists. Some of his assurances in recent times are a nine-hour free electricity day for farmers and a free bargaining program for the government itself. JAGAN ANNA...WHAT IS THIS ANNA? In addition to non-interest loans for every farmer, each farmer will get Rs 12,500 in May for investments. Children spend Rs. 20 thousand is also provided. Parents spend Rs. The government will pay 15 thousand. Every year, this money is deposited in the mother's data. The pension to the poor is Rs. We will increase to 2 thousand. Every parent will get a pension for 45 years. After coming to power, the cost is Rs. The health of Sri Lanka will be applied to every single one thousand Operation is not only free of charge, but it also provides you with rest in the rest period. 10 thousand pensions for long-term patients will be provided. These are the guarantees that the solution to every problem is only a new guarantee that the pair is now added. That is why everybody who owed money to the banks for the sake of economic necessity has given the assurance that the government will give the person the money needed to pay the loan. But it seems to be a guarantee given to the study. It is impossible to estimate the lending of all the banks in the number of banks that it will cost as many as Rs 1 lakh crores. Besides that, Jagan says he will give the money directly to the individuals, not the banks. How much of it is the right thinking, Jagan, Jagan strategists should know only? The Jagan's promises to the whole, the common people, the analysts, the economists are bleeding. There is a mixed reaction from the common man. Because this is because people have a sense of how much money they can collect from the public because it is from public money.